Designed by chemistry, content and technology experts, Reaxys offers an unparalleled level of flexibility for chemistry search and discovery with Quick Search and Query Builder providing easy and versatile entry points to the world of chemistry. If a research solution requires separate search queries to retrieve literature, patents, property data, bioactivity data and commercial availability information, it’s costing scientists time. It’s also difficult to ensure consistent search terminology if the query forms have different requirements or use different search algorithms. With Reaxys, both Quick Search and Query Builder enable retrieval of the whole range chemistry information contained in the database, so there's no need to worry about making multiple searches with different query forms. Quick Search accepts keywords and/or structure input for precise and flexible searching. Query Builder enables drag-and-drop construction of more strictly defined queries. Reaxys interprets the terms entered and presents the result options that are most relevant to those terms. Documents, precise data points, experimental procedures and even author information can be retrieved from any given search input. This search flexibility means that every Reaxys search opens up the whole universe of chemistry. You’ll never need to construct separate searches for properties, reactions, patents and literature again. Reaxys presents the most relevant result options based on the search terms. See more about Reaxys results. 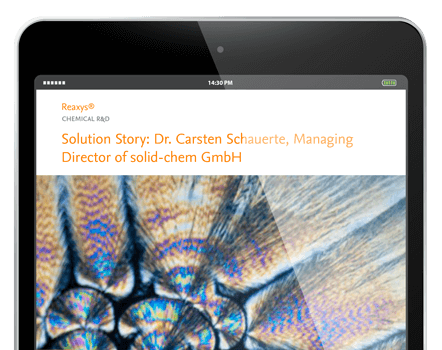 Time is a precious commodity for Dr. Carsten Schauerte, managing director of the chemicals company solid-chem GmbH. Searching for high-quality answers was one of the most time-consuming tasks for him and his team until he started using Reaxys. Thanks to its smarter chemistry search capabilities, he can accomplish more in less time.